Make sure you start wow in 32-bit and run Wow in Windowed mode. Make sure do you use WRobot on administrator Windows session. Try to disable your antivirus/firewall, redownload and reinstall WRobot in empty folder. Delete completely WRobot folder, download and install it again (you can try to download preinstalled version). Try to put WRobot folder on your desktop and in root of the disc. (Re)Install DirectX, Framework (minimum 4.5) (or Framework Repair Tool), SlimDX (4.0 X86), Redistributable Visual C + + 2010 (X86). 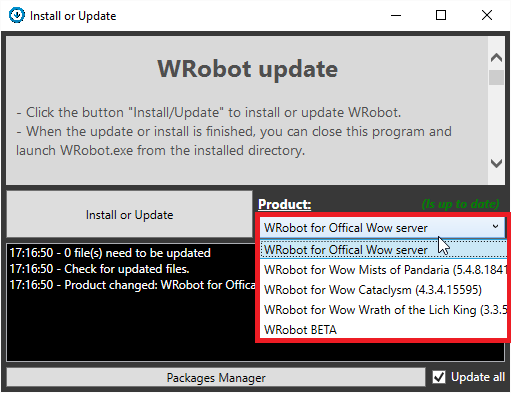 If the bot does not work at all, that WRobot freeze, change the version of DirectX that wow uses (do not forget to restart Wow) (if this don't resolve problem, you can try to launch WRobot with shortcut "WRobot No DX"). Reset key bindings Wow (the bot uses Forward, Backward, Jump, Sit / Stand, strafe right and left, but I suggest you reset everything). Some wow addon can cause problems, so disable all. Close Windows program like Skype, Teamviewer and all overlays e.g. Overwolf, Geforce Experience, raptr, AMD Gaming Evolved, teamspeak (these programs can cause problems at WRobot, also programs for record screen or programs which draw/write in game window). Close/disable your VPN, Proxy and program like ProxyCap. If you have already run WRobot, you can try to remove folde "WRobot\Data\Meshes\". If WRobot window is not display correctly, you can you try to Right-click on WRobot.exe and then click "Properties". On the "Compatibility" tab, select "Disable Display Scaling On High DPI Settings", and then click "OK" ( https://www.youtube.com/watch?v=0xS-UCuyq7s ). Some virus/malwares can block WRobot. Scan you computer AdwCleaner and/or Malwarebytes for remove malwares, and anti-virus like Eset or Kaspesky. Disable "Bliz Streaming" feature, for it, on the Battle.net App, go to upper left corner, click the down arrow, go to Settings. From there, go to Streaming and uncheck Enable Streaming. When WRobot is launched, you cannot minimize Wow, of course you can keep Wow in background and use your computer, but you cannot minize (put in taskbar) Wow (if minimized, WRobot don't works correctly). Do a search to see if a solution exists: https://www.google.com/search?q=site:wrobot.eu+adding+mailbox or http://wrobot.eu/search/. If your problem is not resolved, request help on good forum, to get quick reply, don't forget to share your log file. Download and extract WRobot on your computre. Click on button "Install or Update" and wait few secondes/minutes. When is done, you can click on button "FINISH - Click to close & launch WRobot" to launch WRobot (the next time, you can launch WRobot directly with "\WRobot\WRobot.exe". How to use my license key to unlock WRobot? An window appear, you need to replace text "TRIAL" by your license key (you can click on "+" button to save key). At the end of your subscription, we will send you an invoice with renewal link to remind you to renew your subscription (you can also found invoice here). We will not automatically renew your subscription. Why I can't download files (Error code 1D161/3 : "You are not allowed to download that file.")? To download some files (profiles/fightclasses, ...) of WRobot you need active WRobot subscription on your account. Why I get message "The Game is currently used by this bot or contains traces of a recent of bot usage, are you sure you want to use this process ?" without reason? Just press "yes", if this cause problem (freeze, crash) read step 10 and 14. Since Wow 7.3, WRobot protect executable file, but when this file is protected you cannot move, edit or remove it. To resolve this probleme, in WRobot folder you can found the tool "RemoveFile.exe", run it and select file locked (.exe file with random name like "QaNpTArr.exe", this tools will remove the file and unlock your folder). Open and edit with notepad file "WRobot\Settings \RobotManagerGlobalSetting.xml"
Save file and you can relaunch WRobot.